I am sure you already read all over the internet that many important fashion people (read: designers) were moving so quickly from one house to the other in the last week or so. Yet I would not like to enhance that even more than just a quick mention: Christophe Lemaire for Hermes instead of J.P. Gaultier, Olivier Theyskens for Theory, Giles Deacon for Ungaro and (yes!) Sarah Burton as creative director for Alexander McQueen. 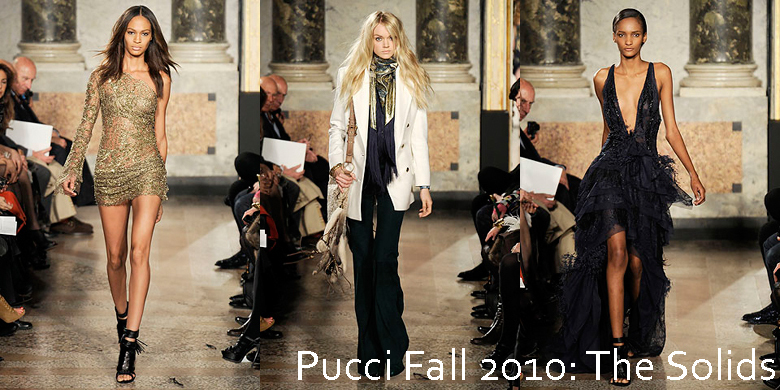 Not so many pages were written when Peter Dundas joined Pucci a year ago. You wonder why my sudden interest in him and the brand? Well, because of this article on the Wall Street Journal stating what disastrous things are happening at Pucci because of the brand supposedly choosing to go "without prints". One thing I do not appreciate (ever) is throwing some shocking and generic facts as a title while contradicting them in the body of the article. However, it is great to see the (good) way a brand can re-invent itself because of the new designer on board. Peter Dundas (who designed for Ungaro until 2007) had to fill some big shoes, following right after the likes of Lacroix and Matthew Williamson. Obviously, his strategy of revamping Pucci is successful: the visibility of the house has been increasing ever since, counting many Hollywood stars as fans. The Fall 2010 collection is brilliant in mixing solids with patterns, with a hint of Balenciaga without those broad shoulders, if you ask me. In any case, the clientèle is happily jumping on the Pucci bandwagon because the new style imposed by Dundas follows the designing spirit of our days: hot, young thing. What will tell if the brand can survive or not is the ability of Dundas to continue mixing old Pucci with new Pucci: to tame down bold prints and bring on more solid youthfulness while staying true to the spirit of the house. For now, all looks well put together, but not as cohesive as it should have been. If we look at some of the pieces separately, we could never tell they come out of the same collection. I can not wait and see the next collection signed by Dundas for Pucci. Not to mention the brand is currently seeking ways to expand into other new ventures such as accessories (handbags, shoes), just like any other powerful brand on the market. Oh, the joy of anticipation!